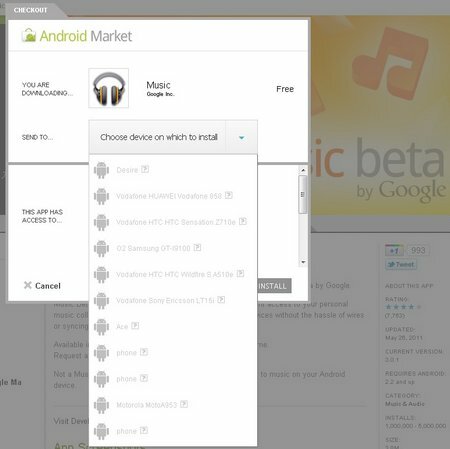 The much-publicised US launch of Google’s Music Beta audio tool appears to be spreading to Europe, with several users reporting SUCCESS in installing Google Music Beta to their Android phones in the UK today – via an automatic update. Reader Kiran also told us Google’s Books app was also available to download via his Nexus S. Anyone else had any luck? They’re visible to Euro users in the Market here and here if you fancy giving it a go. I have installed both Books and Music on my Nexus S with 2.3.4. I cannot find them in the market, only update them in the My Apps drawer. Google music only seems to appear in the ‘my apps’ section of the market too for some reason. I cant install either to my HTC Desire (running custom 2.3.4 ROM). However I do have Google Music side loaded on my Motorola Xoom (running US WIFI version of 3.1) and at least on the Xoom I did get an update for google music last night. I’ve now side loaded it to the HTC Desire but no update showing availble. I dont have google books installed on either and through the web Market place it still tells me its not supported in my location. It’s really frustrating as, even without the cloud storage, I’ve heard this is a much better music app than previous stock versions. Actually the Market Music app is only a update to the Preinstalled ones on the Honeycomb tablets, I Live in finland and can install the Music app on my Xoom, but it does not support Google Music. Same here in the UK. Got the Music app update, but it does not open up to Google Music cloud storage..
I’ve installed both on my Nexus S (2.3.4). The books app is similar to the Kindle app, however I get a message saying I cannot yet buy any books. I haven’t yet worked out how to use the cloud aspect of the Music app. So far all it does is play the songs on my phone. Books and Music successful installed in my nexus S in France. Interesting is that I can’t see them in the market (“cannot be found”) and both are translated to french. Heh, sorry my bad, I should have mentioned it only updates the app bit no cloud storage yet! We can still dream though right?! It actually came up a while ago and couldn’t update it until I decided to long press and hit update! Received on Monday a Google Music Beta invite, I think due to me having an Asus on 3.1 ?? ?, so currently uploading my music to the big G, day 2 so far, damn you slow UK upload speeds… Sideloaded the Music app on to my DHD (CM7) and the cloud bit is all working very nicely thanks. For met getting the invite was not the problem (about 1 week waiting). However while I find the app in the market, it says it is incompatible with my nexus one.